On the eve of my departure from Beijing, I thought I could write a few words about Tiger, my first student, and by far my favorite. 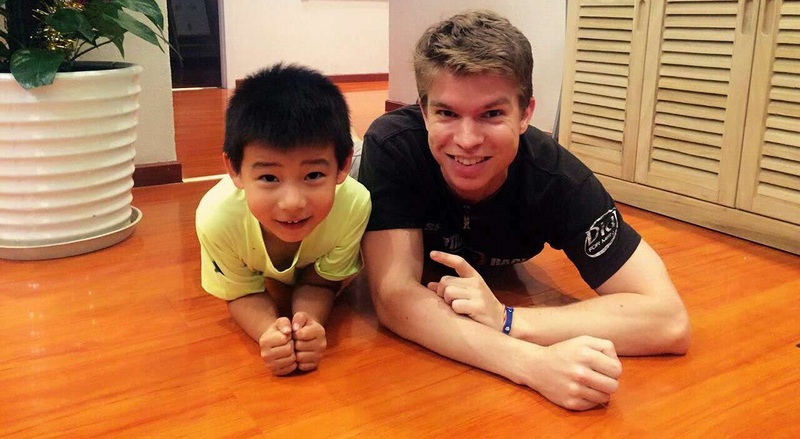 Smart, kind, enthusiastic and positive minded, he definitely was one of the highlights of my year in China. Tiger and his teacher, building chair castles and talking about pirate ships. But today, I had a class with Sun (third from the left on the cover picture). Sun is my nemesis. The hardest children to control in our school. Since his father was told that I would soon leave China, I was offered a parting gift: a bell from a Tibetan Buddhist temple, brought back a few years ago. A particularly special gift considering I planned to go to Tibet myself before going to Nepal in September (Sun’s father didn’t know, of course), before having to change my plans following the earthquakes last spring. But let’s come back to Sun. By far my most difficult student, possibly with a mild deficiency on top of his behavioral problems (Sun’s parents’ English is unfortunately not developed enough to explain everything). A little boy astonishingly strong at only seven years old, independent, incredibly active and could not be more indifferent to learning a second language. My student since October, he made me curse more often than all the other children together, sometimes even in French (when I start swearing in my mother tongue, you better be quiet…). He destroyed much of my material, repeatedly ripped some of my skin and gave me some hard times. But in the end, Sun is everything but malicious. Ultimately, Sun is just one of those kids who do not completely control themselves, with no will to hurt. I’ve always known that and have never asked not to teach him. In fact, and despite all this, Sun laughs a lot. He rushed into the office and immediately throws himself at my neck, shouting “No! No! No! Alex! Alex! “. Chinese workers tried to make him understand that he must go home, but he would not listen. So I explained to him that soon his teacher will be Eric, and he was very nice. What’s more, he himself previously mentioned that he liked Eric and would choose him if he were to change teacher. He hugs me a little harder. This entry was posted in Non classé and tagged beijing, children, china, english, friendship, memories, teaching. Bookmark the permalink. So here we are, it’s been a year.